Whitsunday Bullet is a fast power catamaran in the Whitsundays and is here to take you on the ride of your life! Cruise at top speeds around the Whitsundays and see all the best it has to offer in this action packed day tour. The stable design makes it perfect for hopping around from place to place, checking out awesome locations such as Whitehaven Beach and Hill Inlet Lookout. Guests will also get the chance to snorkel and check out the amazing marine life of the Great Barrier Reef Marine Park during their action-packed day! Tap the hotspots on the floor plan below to view Whitsunday Bullet. Departing from Abell Point Marina, you will head straight to Whitsunday Island, home to Whitehaven Beach and Hill Inlet Lookout. Guests will enjoy a short bushwalk up to the lookout to enjoy the world-famous views of the swirling sands below, taking the opportunity to grab some awesome photos. Afterwards, you will make your way down to the shifting sands of Hill Inlet, enjoy a swim in the clear waters of the Inlet. Then climb back onboard to head to South Whitehaven, where you can try the paddle boards and enjoy a swim or relax on the soft silica sands that Whitehaven is known for. After visiting the Lookout and North Whitehaven beach, you climb back aboard Bullet and embark for South Whitehaven. You will also get to spend some time enjoying the pristine white sand of Southern Whitehaven, where you can experience uninterrupted stretches of beach. Take the opportunity to go for a swim in the calm, protected waters or try your hand at paddleboarding before getting back on board for your destination. Guests will get the chance to snorkel in some of the most beautiful reefs in the world, right here in the heart of the Whitsundays! This premium tour will take you to the North end of Hook Island or Hayman Island where snorkellers can check out the beauty of the underwater world from above. With abundant marine life and crystal clear waters, you will have a snorkelling experience unlike any other. With luck you will get to swim with George the Giant Maori Wrasse or come up close and personal with a local Green turtle, these magnificent creatures are seen on just about every trip. Whitsunday Bullet is very proud to be the first day tour to offer stand-up paddleboards for use by all passengers! We carry eight paddleboards on the vessel with half those being designed for two people at a time. Learn what the stand-up paddleboard craze is all about with Bullet! Enjoy the exhilarating experience gliding over crystal clear waters, gazing down at the fish life below. Our experienced crew will train even the novice beginners on how to manage this exciting new Aussie sport! Buffet style lunch means you will not leave hungry and offers enough choices to satisfy the fussiest diners and you can go back as many times as you like. The vessel caters for vegetarians, vegans and gluten-free diets. Snacks are also served through the day. Water and soft drinks and alcohol are available on board for purchase. No BYO please. After a fun filled day of sight seeing, snorkeling and great food, you return to the marina around 4.30 pm and your complimentary courtesy bus will be waiting to take back to your accommodation. This new vessel is fast becoming the must do day trip of the Whitsundays Islands. 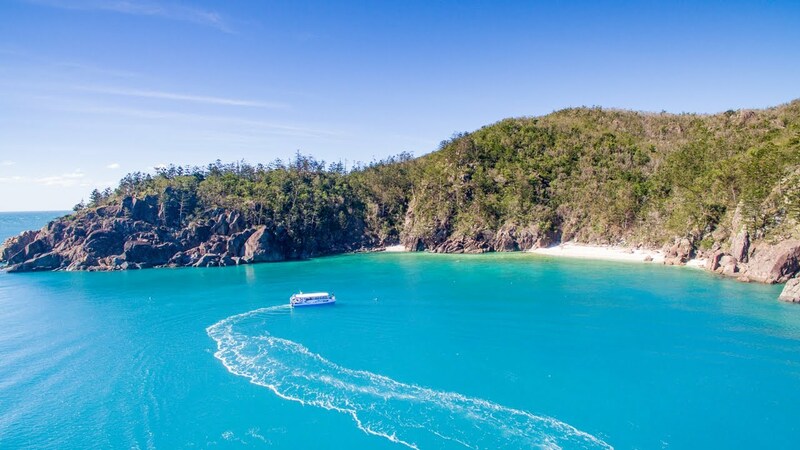 By combining the North and South shores of Whitehaven beach with a visit to the picturesque Hill inlet lookout, you truly will have a day to remember. *Backpackers must be aged 18-35 and have a valid backpacker card OR proof of staying at an Airlie Beach hostel (receipt) or campervan receipt. On board purchases such as snacks and water. Any cancellations made more than 72 hours prior to departure will forfeit 25% of the total ticket price. Cancellations made within 72 hours prior to boarding will result in forfeit of full trip fees. Any passenger may elect to transfer their travel to another day with notice prior to 3pm the day before departure. No refunds will be given on transfers. An Admin Fee ($40) may be applied to postponements or transfers. Card fees are non-refundable. If the sailing company has to cancel the trip (prior to the boat's departure) and we cannot offer a suitable alternative, then a refund will be given minus card fees. We strongly recommend that you have travel insurance, especially during the wet season. Thank you for booking with Mr Travel/Sailing Whitsundays. If you need any advice or assistance making arrangements for your accommodation or transfers please do not hesitate to ask.